Musically, the band trades in well-worn hard rock/heavy metal sounds with a garage flavor. Add some more polished production, big hair and tight pants and change all the lyrics to be about girls and/or drugs, and most of this would sound right at home in the mid-’80s metal scene. With the rough-edged, garage take on those familiar riffs and rhythms propelling frantic songs about zombiegeddon, it sounds right at home in my stereo. And considering the large degree of crossover between metal and horror fans, I’m certain I’m not alone here. The tunes are a mix of riff-driven, shouty rockers and more restrained, power-ballad style songs — or a mix of both. Both styles work well, and the variation and shifts in dynamics keep the album from becoming repetitive.The lyrics are near-perfect in their depiction of classic zombie apocalypse tropes and they go a long way, along with the singer’s rough-edged, throaty voice, toward making everything work. That’s not to say the rest of it doesn’t work — there are some excellent guitar tones and tasty riffs, some nice, tight bass lines and solid drumming everywhere (not to mention a touch of piano) — but those lyrics and the singing push it all over the top. 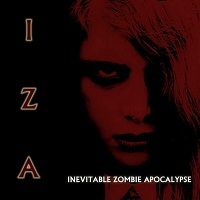 Any song could be called a standout, but I particularly like “Inevitable Zombie Apocalypse,” “Aim for the Head” and “Dead World,” and the closer, the piano-based “IZA Reprise.” Some indie filmmaker out there needs to license this album for his micro-budget zombie movie, because it would instantly make most of them a hundred times better. It’s several times as good, plot-wise and as a zombie experience, than most of the indie zombie stuff I come across in any medium.